Dunks (http://thefunkhunters.com/), Willisist + Eradik (http://Shahdjs.com/), and DJ Don Chow! Door proceeds support the #W2Belongs2Me Legal Fund! Support a community-run project that needs our love right now as they push back a City eviction notice. With the closure of the Waldorf as we know it, come out and show some love for Vancouver’s independent culture spaces. ENTRY: Roll 2 Dice for cover – roll a 12, get in free! 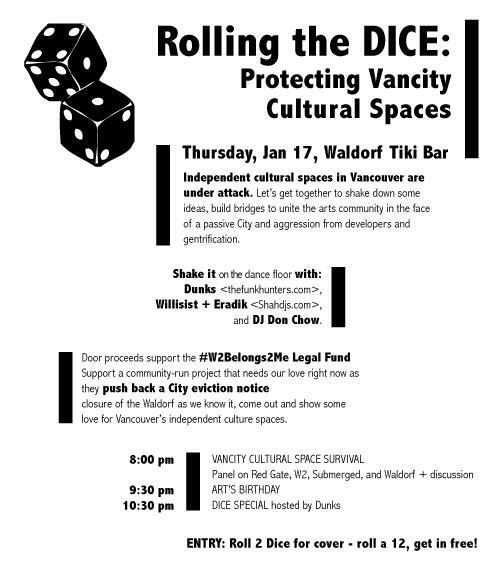 -8pm VANCITY CULTURAL SPACE SURVIVAL – Panel on what can be done for 3 key Vancouver independent culture spaces, wth panelists and discussion. -9:30pm ART’S BIRTHDAY – Come for the cake! It’s an annual global celebration on Jan 17 recognizing the birth of art! Hosted by DJ Don Chow (http://www.facebook.com/teahousemusic). We get things started at 8pm with a Panel Discussion on Vancouver’s Cultural Spaces, and we’ve invited experts on the subject to talk about The Red Gate (proposed new home on Industrial), W2’s struggle for respect in the Woodward’s complex, and The Waldorf Hotel’s sell-off by their landlord to Solterra Development. What can be done to support these vital Vancity cultural institutions, and where to from here more united! This is followed by a birthday party! And on this sombre information and ideas-generating night, we’re not just celebrating any old birthday party – it’s Art’s Birthday! Performances from a variety of older and newer Vancouver legends provoking #NoFunCity by showing how critical emergent and dynamic culture is, the people and spaces. Then the evening goes off the hook with the Waldorf’s Thursday night full of funk and funk-inspired beats from a cast of Vancouver DJs and cultural promoters who contribute to Vancouver’s dynamic arts community. Hosted by Dunks.